“I’m always chasing rainbows,” was often sung by my mother although she always saw colors even where drab was visible to anyone else. And the famous song from “The Wizard of Oz” with “Somewhere over the rainbow” was supposed to be inspirational, although I much preferred “Follow the yellow brick road” with its happy beats. But pots of gold, and wishes were associated with the arc that sometimes appeared after rain. For me, during girlhood, the word was part of place’s name. Perhaps you’ve a tangible landmark that draws you back in time and evokes past experiences. Maybe it’s a covered bridge in Vermont, train station in downtown Los Angeles, aquarium just over the Ohio River in Kentucky, Ben Franklin’s statue at Penn. Maybe there’s even a song-word that takes you back in time. I live near Lake Ontario and it is 400 miles from once-familiar so I’m not aware of downstate alterations in property. When a newspaper mentioned New York City’s Rainbow Room re-opened autumn 2014, I recalled its slightly noisy revolving dance floor which, the article noted, had been replaced with one that silently circles. Do memories quietly spin? Rockefeller Center was for ice skates, dining at either restaurant at each end of the rink while watching twirling blades, and the Rainbow Room. A childhood delight, with my parents, was to take the elevator to the 65th floor. I felt special. Many nightclubs were geared for families; I could “swing and sway with Sammy Kaye” at the Hotel Commodore, and actually was given a baton to lead the band. While that was eventful, there was no sensation of ‘wow’ when I walked into there as I felt when a skyscraper’s windows could capture clouds and rainbows might appear in such a view. didn’t see required little time and effort., but, for me, the majesty of the building changed when it became a classroom. My commute to Columbia from Flushing was by Long Island Railroad, then a subway. Most grad school courses were at night since many who attended had day jobs. Wednesdays actually had a few daytime classes, and was when I went to the NBC Studio and saw “Howdy Doody” in the making. Did my widow-mother worry when I boarded a subway very late at night, and if I missed the last Port Washington train from Penn Station and had to continue by subway to Flushing Main Street, board a Q-28 bus to 165th Street, then walk to my childhood house? I didn’t realize until I had adult children how difficult it had to be to keep that concern to herself, or why she stayed up until she heard my key in the doorlock. buggies from Central Park. Rumpelmayer’s ice cream in the Hotel St. Moritz, when my parents offered me an extra-special dessert treat, closed in 1999. What spots are etched into your recollections? Was a juke box present in the space you enjoyed hot fudge sundaes while sitting on red leather seats? Does a specific tunnel or bridge bring you into a time-period and make you smile? Did you feed pigeons by a statue in a park that evokes thoughts if reading about that area? Although I still live 400 miles from my growing-up place, and may have physically been transplanted, some special memories are, as the Rainbow Room, still seeing the colored streaks in the sky. Summer 2017, an in-town granddaughter was going with another college friend to New York. What might I want her to see to snap on her phone and e-mail? My ‘don’t miss’ suggestions, for her, were different from this question. She did pass Atlas’ golden body holding up the world, glanced at an area she’d been told held artificial ice during the season, took an elevator to the 65th floor .... a guard was present. Seems 9-11 affected even taking a peek at the Rainbow Room when not in use. Her “sorry” was whispered into her smartphone. Ace Joseph Cardona is a young adult writer who has been writing poetry since elementary school. Helping Ace to cope from his brutal experience from childhood psychological trauma which include years of repeated sexual abuse by his older siblings, physical and emotional abuse by his mother while being neglected . Ace suffers from Complex PTSD, Suicidal thoughts and depression, he started to write poetry as an outlet and a way for ace to express his emotions through visual context. Even though he suffers mentally everyday, Ace tries to make the most of it work through his writing. He has no contact with neither side's of his family but does currently resides in Transitional Housing by himself. Ace has not written or published any books at the moment. I take a pull of these toxic cigarettes thinking it can relieve some type of stress or pain while listening to the song " Family Portrait " By P!nk. I know I can't continue to go on like this, I know I will never be happy knowing that the blood that flows through my veins I wish for you to desperately see. I wish you can see how much i hurt for you momma, I have so many questions to ask you but I know they won't never be answered. I don't know why my heart beats so much for you but it does; I wish you could hear me, I wish you can see the pain you once endure on me, I still have to suffer through everyday. I can't sleep at night without waking up in constant pain from your abuse, I wake up crying, shaking, screaming in pain. Coughing up what I believe is to be blood is just the pain I can't no longer bare with and sits at the pit of my stomach. Your abusive ways left me in fear, while i had put myself in situation and places I thought was OK but it wasn't. I go to therapy and bring up the remainder of feelings you left me with like: the pain , the betrayal, the neglect, the hands that gave me life. Never once gave me a gentle hug and told me it was going to be ok, I sit here at this dining table in my one unit apartment and continue typing. I try to think of questions to ask you, but the only things that runs through my mind is " WHY"? It might seem like a blank questions, but the blanks are left for you to fill in as I know they will always remain empty. I try to look for so many ways out momma, I try to push the thought of self - harming away but the eager feeling gets stronger. I don't know what led for you to treat me this way, as my therapist tries to tell me maybe you had a bad childhood yourself… Is it true momma, did you have a bad childhood? This question runs through my mind as well. Maybe your choice's is what led you to hate me because you saw a reflection of you looking back in me? I can't cry anymore momma, my tears have become stale from filling up so many buckles for the past 21 year's , I have no more left to give. I think about you as I make fake social media accounts to spy on you and see if your ok .
You see, part of me still cares for you regardless on what your feelings are towards me and part of me hates you and tries to pilot on revenge to hurt you, but I can't . And I won't hurt you, because I only crave for you to love me ... It hurts when I think you're sad, it hurts knowing you're getting older and all I want is for you to say " I'm Sorry " and I know this will never be true for the moments that continue to pass by. No one will understand the love I have for you, I can repeat my trauma so many times that it starts to cause physical and more mental pain. Leading to different parts of me to come out and take over crying as well. I sit on this cold bathroom floor and continue to type every word and every feeling I have towards you, while the song from P!nk is still on repeat. I want to fight, I want to hit, I want break down and cry constantly knowing the holidays will be coming up soon. I want to just drape a dark cloth over my face and escape to a favorite place I always wanted to go to. But where would that be momma? What favorite place would that actually be? Maybe the hospitals? Maybe the restraints I was always put in because I didn't know how to deal with my anger in mental asylums? Or maybe to heavy medications where i was inject with to become more numb? Or the dark nights where I was constantly sexually abused by the hands that knew they could get away with it because they were mommies favorite boy's? Some might believe that art and science are nothing more than two different academic subjects that are part of school. They might also make the argument that art involves imagination while science involves reasoning. Nevertheless, the world actually needs those two opposing concepts because the world will not be what it is without the both of them. 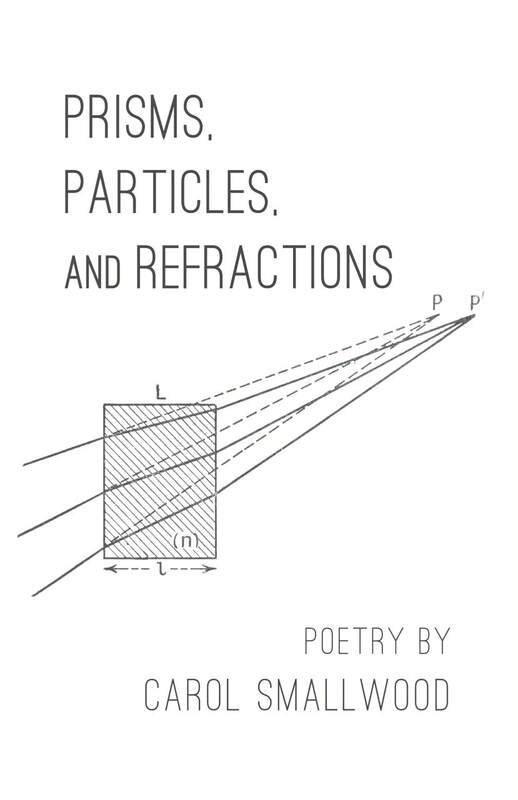 Carol Smallwood has a poetry collection entitled, Prisms, Particles, and Refractions. Smallwood effortlessly blends science with art because of her profound examination of those two topics. Carol Smallwood analyzes light from both a scientific and an artistic perspective to reveal how light contains scientific aesthetics. People with proper vision might be able to see light with their naked eyes, but they might not truly comprehend its beauty. People would not be able to function without light because light symbolically represents knowledge. Smallwood has a very wise introduction because she teaches readers to treasure light for its ability to let people function. Not much might be known about light, but people can still appreciate that blessing. Smallwood also briefly discusses how people take light for granted, and that light is one of the greatest mysteries of the universe. Smallwood divides her poetry collection to cover three topics about physics. The first section is called, “Prisms,” and Smallwood reveals how precious life truly is. Specifically, the poem “Cuttlefish” is about natural beauty. The cuttlefish symbolize the majesty of natural wonder that people are blessed to have. Even though some animals might be dangerous, like snakes, other animals offer companionship. The lines, “survive by matching their / environment” (1-2) reveals the power of adaptability, and that people are capable of dealing with change. There is the classic saying that the only constant in life is change, which means that people need to learn to adapt to their environment filled with variety and diversity. In a way, people are like cuttlefish because all people are fundamentally creatures. Therefore, Carol Smallwood offers interesting perspectives on humanity. The second section of this poetry collection also reiterates the fact that people are just small beings within the vast universe. There is a very powerful poem entitled “Live With It” that deals with coping. Within this poem, the main subject has vision problems, which might or might not have been caused by light. Smallwood offers a different look at light as a symbol because it can be interpreted as a blessing and a curse. Nevertheless, people have to deal with the fact that good and evil are just fundamental aspects of reality. The poem contains repetition of the line, “When the doctor said cataract surgery wouldn’t help, I sighed.” Sighing is symbolic of being able to breathe, and that the air people breathe really is a blessing. People might have to encounter tough times, but life can still continue just as long as people are able to take their sacred breaths. Life might be dismal at times, but there is still hope for a brighter future. Because of these fundamental facts, Smallwood once again reminds readers to not take their lives for granted. Life really is a gift after all. The final section is entitled, “Refractions,” and it deals with possible changes of the path that light travels on. In spite of the complexity of this concept within physics, Smallwood still masterfully gives this concept a sense of beauty with her poetry. For example, the poem, “The Sun Acquires” reveals how sunlight really is a blessing. That is because the sun is constantly, “battling clouds to warm shorn fields” (2). Furthermore, sunlight also has the power of “granting light to those who seek it” (3). The notion of people seeking opportunities means that there are those yearning to live meaningful lives. The light once again serves as a symbol of the knowledge that people acquire when they persevere. Ultimately, light is powerful because it allows people have truth and knowledge in spite of the bleakness of reality. Even though light might represent knowledge, reality is still very subjective. Smallwood addresses that paradoxical truth with the poem, “Icons.” The last two lines of this poem are, “The more icons are studied in plain sight / the less (like cats) we understand” (6-7). The shift from an optimistic view on light to a more pessimistic outlook suggests that nothing really is what it seems. In one way, light can bring about knowledge, hope, and creativity. At the same time, though, light and knowledge reveal harsh truths, such as the inevitability of death. People might also make the argument that they truly understand something when they really do not. Additionally, people are also fundamentally creatures by default, much like the cat in this poem. Because of these complex and contrasting ideas, Smallwood suggests that there really is no such thing as absolute truth. Some critics might also go against that notion as well, all of which reveals how reality is very subjective, and that truth is a very mysterious concept. Carol Smallwood has the talent of making scientific concepts artistic. Her previously published poetry collection entitled In Hubble’s Shadow also deals with science and the mysteries of the universe Smallwood actually defies conventional poetry because her writing includes a unique combination of traditional poems along with contemporary creations. It can be very challenging to create art, but Smallwood has done it again with Prisms, Particles, and Refractions. Readers really should enlighten themselves with the knowledge and wisdom that Carol Smallwood provides in her creative writing. The world really does need artists in order to educate others while providing beauty within the monotony of daily life. Life might be tough at times, but hope allows people to move on in spite of the darkness that is an essential element of reality. Because of the universal fact that there are both positives and negatives within all aspects of reality, it is a blessing to know that poetry can enlighten the mind and soothe the soul. Thank you, Carol Smallwood, for writing about fundamental truths within human existence! When I remember Grandma Josie, she is not the blind woman with the swirls in her eyes. She is not the frail woman fitfully trying to sleep as her amputated leg mysteriously aches. She is not the woman in the nursing home, in the still, lonely morning hours before her family visits. The Grandma Josie I remember is holding me on her hip, dancing a polka. Her head drops back as she laughs, her bright eyes an impossible shade of blue. My Busia is soft and plump and lovable. She is moving from person to person, giving hugs and kisses to the people crammed inside her tiny, neat home--passionate people whose ideas, opinions, stories bounce off the walls all at once. They talk about their favorite subjects—politics, family and faith. She is the one neighbors visit—for food, for homemade herbal remedies, for prayer, for compassion. She is the conductor of a spirited orchestra, knowing what to ask of whom, smiling as everyone gives the maestro their best, and in turn, she gives her best to them. Her appearance is humble, but her presence is royal. Yet she is more servant than queen. She is in this place not merely through fate, but through courage and the countless tiny decisions that swept her over thousands of miles of sea, from a land that held every answer, to a land that held only questions. Josie Czaja was just 12 when she made the passage with her mother, father and siblings to Ellis Island, their names signed neatly on the ship’s manifest. I don’t know why the Czajas left their homeland. The early 1900s were turbulent political times, but it would be nearly a decade before World War I ravaged Polish lands. They arrived in 1905, part of the first of three waves of Polish immigrants who settled in Polonias—Polish communities across the United States. They were among the earliest group who navigated to Baltimore. By 1940, nearly 9,000 Polish immigrants lived in the city. The family settled in the growing neighborhood of Canton, a place with brick and flagstone row houses where the children sat outside with friends on marble steps, which their mothers scrubbed clean each weekend. I had no details about how Grandma Josie’s parents made their living in Poland, but since they opened a confectionary store in Baltimore, I assumed they had business experience. At the same time Josie was helping her parents at the shop in Baltimore, her future husband Walter was making the same journey from his native Poland to Ellis Island. I pictured him pulling a scratched, dented trunk onboard the ship. The trunk held his past. His shirt pocket held his future--five dollars and a slip of paper with his brother’s address in New Jersey. Eventually, Walter Koros settled in Baltimore and met Josie. The couple married when they were in their mid-20s and their celebration would be a grand affair. They would carry on the same traditions they saw at their parents’ weddings, traditions continued at my mother and father’s wedding, and at my own. My grandmother’s lovely long veil was replaced with a small lace czypeck—a small caplet that indicated the bride’s role had changed. The groom’s hat, a wish for fun and laughter in the marriage, was hand-made. My own husband’s hat was adorned with large yellow roses. “Necklaces” fashioned with ribbons and tiny plastic babies were placed around the bride and groom’s necks—an acknowledgement that children would be welcomed into the family. In their wedding photo, my grandparents had movie star good looks. Josie held a massive bouquet of white roses tied with a thick white ribbon, fit for a Hollywood wedding. In their eyes, I saw a flash of light that reflected their joy, but also their resolve. The newlyweds bought a large corner row home in Canton, divided in two. The first half was for living. The second half, walled off from the residence, contained their corner grocery store. In the half where they lived, there was a cozy living room where all five children, spouses and grandchildren squeezed in, sometimes all at once. I remember trying to find space on the floor to sit. No one had to tell us that the chairs were reserved for the grownups. Often, the Saturday night family card games of pinochle or pitch continued all night and ended in time for the family to dress for church. On the other side of the row house was Walter Koros Groceries, the family’s name painted professionally on the large storefront window. The deli case held homemade kielbasa, stuffed into casings by my grandfather who used a machine kept just above the store, in the hall outside my grandparents’ bedroom. Each week, Grandma Josie negotiated prices with the man in the straw hat, whose horse drawn wagon delivered soft golden mushrooms, sweet onions and firm brown potatoes for the pierogis; cabbage for the sauerkraut. We often visited my grandparents on Sundays, when the store was closed. Sometimes the living quarters seemed manic with so many loud people crammed in such tight space. When we opened the door between the two parts of the rowhome, we entered a different world. Inside this new world, there were only muted sounds from next door. The aisles were empty, the cans stacked neatly, all labels uniformly facing front. As children, our eyes were drawn to canned colas, peanut butter treats, and chocolate candy bars. The floor’s immaculate tiles reflected our saddle shoes. The ledger sat directly next to the register. I never looked inside, but my father told me the books kept an account of money owed. Most customers, who worked at the American Can Company and other Baltimore factories, brought their accounts up-to-date on payday, but some took longer. My grandparents continued to give them food, even as bills accumulated. Life was simple. To escape the summer heat of the city, the family took day trips to “the shore” -- Baltimore County beaches just a short drive from the city. Sometimes my father and uncle would gather up nets and chicken livers for bait, then launch a small rowboat to go crabbing. They built a fire on the beach and boiled water, tossing in the live crabs with handfuls of spices. Josie covered splintered picnic tables with newspapers, spreading out the steamed crabs for lunch. As a child, I thought Grandma Josie’s life was perfect. Now I know that life is never perfect, even when it’s good. When I was older, I learned that Grandpa Walter was seriously ill for many years before Tuberculosis finally took his life. I learned that Grandma Josie simultaneously ran the grocery store and worked at The Packing House in Baltimore, canning tomatoes and green beans. She worked the assembly line so she could collect Social Security checks when she turned 62. My grandparents buried two sons. One was still a baby and the other, Michael was 18 months old. At that time, birth and death were revealed in the same place—at home. Mothers delivered their babies in their bedrooms. The deceased were presented in coffins in the living room for visitors to pray over, so that God would accept them into heaven. Grandma Josie dressed her two sons for eternity, in simple white garments. As she raised their small heads to put on the clothing, threaded their tiny arms through the sleeves, did she think of the first time she dressed them? The same family and friends who visited the house in joy to welcome the new children would be the same people who came to grieve their loss.